Myanmar will not only captivate and bring you to a spiritual journey but will also open you to the fascinating sounds and sights of its meaningful festivals. For the beautiful people of Myanmar, there is always something to celebrate month after month. The celebrations are rich with historical significance and one cannot help but be astonished by the practices and rituals that date back hundreds of years. Greeting the year is the Kachin Manao Festival, where the delightful people of Kachin would adorn themselves in beautiful traditional costumes and motifs to celebrate the reunion of tribes and their rich history of winning battles. The month of February celebrates the Harvest Festival. Tribes would converge to cook htamane, a special variety of sticky rice combined with ginger, peanuts and sesame seeds. March commemorates the nationwide Shwedagon Pagoda Festival. The processions are held during a full moon at the foot of the local pagodas. As a custom, many people would build pagodas out of sand as a form of good luck. The Shwedagon temple is roughly 2,600 years old and is 300 feet tall. Its dome is inlaid with gold and precious jewels. 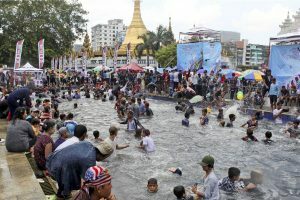 Thingyan Festival is celebrated mid-April and is known as the Burmese New year. Water games are held, colourful parades and events like the gadaw which means obeisance to the elders fill the four-day festivity. In May, a very significant festival is held. It is called the Watering of the Bo tree Festival. Men and women of all ages pay homage to their local pagodas to pour water on the holy Bo Tree to remember the birth, enlightenment and passing of Gautama Buddha. June ushers the Tipitaka festival. Also known as the Three Baskets of Learning, this is held every third week of the month. This is when examinations are held for the monks and nuns who are studying the scriptures of Buddha. The highest level of test is called the Tipikadara. This is done nationwide. Dhammasekya Day or Robe Offering Festival is held in July. Shinbyu ceremonies are a representation of Buddha’s search for enlightenment. Novices in the monastery are dressed in glittering clothes and made to look royal. They are paraded around followed by their parents and relatives with musicians in the background. This also marks Buddha’s first sermon on the Four Noble Truths. The month of August focuses on the Taungbyone Festival. The aim of this celebration is to “make the Nats or Spirits happy”. The event lasts 6 days and the participants very animated. The air is thick with the scent of flowers and offerings to the nats abound. Regatta races are highlighted in September. People would converge during the boat rowing competition to root for their team. Phaung Daw Oo Pagoda festivalis also held. This is where 4 of the 5 Buddhas swathed in gold that are sheltered in Phaung Daw Oo Pagoda are placed in a barge and brought to several places. Festival of the Lights is the main event in October. 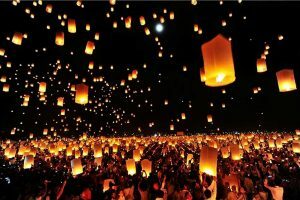 On a full moon day, religious Buddhists and monks alike ceremoniously light 9,999 candles. It also signals the end of the Buddhist lent. Hot air balloons and fireworks displays are part of the festivities. November marks the Kahtein Thingan Offering Festival. Lay Buddhist gather in the pagodas and donate new robes for the monks. Robe weaving contests are also held and this too, has religious significance. The ethnic group Karen celebrates New Year in December. Races, competitions, traditional boxing matches are held in grandeur. It is considered a national holiday. Ritual feasts in the honour of the nats are also being practiced all over the country.